Treatment of uremia by hemodialysis has become widespread over the last 40 years and has improved substantially over that time. However, people treated with this modality continue to suffer from multiple disabilities. Retention of organic solutes, especially those poorly removed by hemodialysis, likely contributes to these disabilities. Certain classes of solutes are removed less well than urea by hemodialysis and by the normal kidney. These include protein-bound solutes, relatively large solutes, sequestered compounds, and substances removed at rates higher than urea by the normal kidney. Several strategies could be used to discover the solutes responsible for residual morbidities in standardly dialyzed people. Rather than continue to focus only on urea removal as an index for dialysis adequacy, finding additional approaches for removing toxic solutes with characteristics different from urea (and the similar small solutes it represents) is a desirable and feasible goal. For several decades, virtually all uremic patients in the developed countries have received treatment aimed at replacing kidney functions, mostly some form of dialysis. In the United States, this broad provision of a life-sustaining therapy began 40 years ago with the extension of Medicare coverage to people with ESRD. Chronic dialysis treatment has expanded from highly selective experimental care in a few academic centers to industrial delivery, largely by for-profit companies. The social, economic, and medical forces that have made dialysis widely available are inspiring. However, the growth in dialysis care has not been accompanied by an equally impressive improvement in dialysis methods. Without doubt, dialysis as practiced even in 1972 was effective at sustaining life and awakening patients from coma. However, despite some important incremental advances in ESRD care, people living on dialysis today suffer a large number of still largely unaddressed disabilities (Table 1) (1). It is important to note that many also suffer from the complications of their primary disease process, particularly diabetes and hypertension, and even restoration of normal kidney function does not reverse these. However, the general success of renal transplantation does indicate that improvements in hemodialysis that provided a closer approximation of normal renal function would improve the lives of even those with chronic diabetic and hypertensive complications. The set of signs and symptoms still present in people receiving dialysis currently defined as adequate have been described by Thomas Depner, who wrote the following: “Patients who would have died from uremia but survive because of dialysis suffer from a previously non-existent life-threatening disease that is labeled here for lack of a better term the ‘residual syndrome’” (2). As he described, this syndrome likely has complex origins. We assume that at least some of these residual morbidities are due to retained organic solutes that are poorly removed by dialysis. Dialysis as practiced does not faithfully reproduce normal renal function or the endocrine functions of the kidney. Conventional hemodialysis treatment aims at removing about two-thirds of the accumulated total body urea content during each of three weekly sessions. Urea itself seems to have little toxicity (3). Conventional hemodialysis also removes other unidentified toxic solutes but removes them as well as urea only if they too are small, unbound, and traffic readily across capillaries and cell membranes. Removal of other compounds may be limited due to large molecular size, protein binding, or sequestration within body compartments. Consequently, conventional dialysis has widely different effects on uremic solute levels owing to their different chemical characteristics. A list compiled >10 years ago by the European Uremic Toxin Work Group identified >90 compounds that accumulate in patients on dialysis (4). The application of new analytic methods is lengthening this list (5). Thus, identification of the chemicals responsible for the residual syndrome is a formidable task. A rational approach is to first consider those general classes of compounds that are poorly removed by dialysis compared with urea. The early dialysis membranes provided diminishing clearance of solutes larger than urea, which has a molecular mass of 60 D, and afforded very little clearance for solutes >1000 D (6). Development of more permeable, high-flux membranes allowed the removal of the larger molecule β-2 microglobulin (12 kD), which had been associated with acquired amyloidosis. However, uremic solutes that are relatively large compared with urea, including β-2 microglobulin, are poorly cleared by even high-flux dialyzers compared with the normal kidney. For example, the clearance of β-2 microglobulin by the normally functioning kidney is close to the GFR or about 100 ml/min, whereas the clearance of β-2 microglobulin by a high-flux dialyzer is about 35 ml/min. Summed over a week, the normal kidneys thus provide about 1000 L of clearance, whereas high-flux dialysis provides about 20 L. Even with high-flux membranes, levels of β-2 microglobulin in dialysis patients are therefore >20-fold higher than normal and would indeed rise even higher if there were not some nonrenal clearance of this solute (7,8). By comparison, the typical time-averaged urea levels are usually about three-fold normal because the dialysis provides about one-third the weekly total urea clearance of normal kidneys (Figure 1). Examples of potentially toxic large molecule compounds in addition to β-2 microglobulin include complement factor D, various advanced glycosylation end products, and fragments of parathyroid hormone, with the application of proteomic techniques adding steadily to this list (4). Time-averaged plasma solute levels in patients undergoing conventional thrice-weekly hemodialysis. Uremic solutes that are relatively large compared to urea are poorly cleared by even high flux dialyzers. The increase in the level of p-cresol sulfate would be of even greater magnitude if free rather than total plasma solutes levels were compared. The protein-bound uremic solutes have a low clearance because only the unbound fraction is available for diffusion across the dialysis membrane (9). In the normally functioning kidney, the protein-bound solutes are removed through the active process of tubular secretion, which efficiently transports the free moiety across the tubule cells into the lumen. This process transpires with such efficiency that for many such solutes a large fraction of the incoming bound portion is removed in a single pass. Dialysis does not replicate secretion, however, and the weekly dialytic clearance of many of these compounds is less than one-tenth that provided by the normal kidneys. As a result, their levels in patients on dialysis are typically >10 times their concentrations in normal serum (10). The increase in plasma levels is of even greater magnitude if free rather than total solute concentrations are compared. Furthermore, recent experimental and clinical studies have suggested that the two most studied protein-bound solutes, indoxyl sulfate and p-cresol sulfate, have toxic effects both in experimental and clinical studies (9,11–16). The time-averaged clearance of protein-bound solutes provided by peritoneal dialysis is even lower than that provided by hemodialysis. However, plasma levels of p-cresol sulfate and indoxyl sulfate do not rise higher in peritoneal dialysis patients than in hemodialysis patients. The reasons for this are not completely understood, but appear to include reduced production of the solutes as residual function is lost in peritoneal dialysis patients (17,18). A third category of toxic solutes that are difficult to remove through conventional dialysis are those sequestered in compartments in which their concentration does not equilibrate rapidly with that of the plasma. Dialysis rapidly reduces the plasma concentration of such solutes but clears only a limited proportion of the total body solute content if they do not readily transfer out of intracellular water or other reservoirs. The best known example of a sequestered solute is phosphate; however, some organic solutes, including guanidinoacetic acid, guanidine, and methylguanidine, appear to behave in this manner (5,6,19). Similar to protein-bound solutes, sequestered molecules respond differently from urea to changes in the dialysis prescription. Solute movement in and out of erythrocytes deserves additional consideration. Urea has selective membrane transporters that facilitate its diffusion in and out of red blood cells (20). Therefore, with adequate dialysate flow and dialysis membrane size, urea is removed from both plasma and erythrocytes as blood transits the dialyzer. For this reason, changes in hematocrit have little effect on urea clearance by hemodialysis (21). Molecules without facilitated transport in and out of cells, like creatinine, cannot have a dialytic clearance exceeding plasma flow. Therefore, their dialytic clearances are lower than the dialytic urea clearance and, unlike urea, they may be dependent on hematocrit. Some other molecules with higher intra-red blood cell concentration compared with plasma include methylamine and methylguanidine (22,23). They also appear to be sequestered in other cellular compartments as they have volumes of distribution greater than the body water. For these reasons their fractional removal by dialysis is less than that of urea and they display considerably more postdialysis rebound as cellular compartments release them into the extracellular fluid after cessation of treatment. Urea and solutes like it are cleared at the highest rate by hemodialysis. All other solutes are cleared at lower rates. This is not true for the normal kidney. With normal renal function, urea clearance is only one-half of creatinine clearance. Other endogenous compounds, such as hippurate, may be cleared at rates ≥2-fold the rate of GFR or about five times the clearance of urea. Of course, these high clearances result from active tubular secretion, whereas dialytic clearance depends largely on diffusion. As a result of the much greater relative clearance by the native kidneys, patients on hemodialysis have hippurate levels 20–40 times those in normal participants (24). Hippurate does not seem to be particularly toxic, but other undiscovered compounds that also enjoy large secretory clearances by the normal kidney may be toxic and would also be expected to circulate in equally large multiples in dialysis patients. In 1939, the early renal physiologist James Shannon, who was also the first director of the National Institutes of Health, asked rhetorically whether loss of renal secretion might contribute to the symptoms of CKD. After raising this possibility, he wrote: “The answer to this question must await the further identification of those substances which make up the unknown portion of the urinary constituents” (25). We have yet to exploit this insight at least in part because we still have compiled only a limited catalog of secreted toxic metabolites. Dialysis removes some important vitamins, minerals, and trace elements. Water-soluble vitamins are filtered through the dialysis membrane and require supplementation if intake is low. Vitamin C is one such compound. Dialysis removes 80–280 mg of vitamin C with each treatment (26). Vitamin C deficiency is exacerbated by the restricted diets required for ESRD patients that prohibit potassium-rich foods that provide the major portion of dietary vitamin C. Another hydrosoluble vitamin, folic acid, was shown to be significantly cleared or lost during high-efficiency hemodialysis (27). Furthermore, minerals like zinc are also removed by usual dialysis and may require supplementation. Loss of amino acids during dialysis has been documented and likely contributes to malnutrition in hemodialysis patients (28). Because there are presumably unknown toxic molecules that accumulate in dialysis patients, there may also be some unknown valuable molecules that are inappropriately removed by hemodialysis. Even with classification of candidate solutes into identifiable categories of those removed less well than urea, final identification of solutes responsible for the residual syndrome will require better assessment of clinical endpoints. The HEMO study of dialysis efficacy, which was focused on interventions designed to enhance urea and β-2 microglobulin removal, used death as a primary outcome (29). The emphasis on mortality as an outcome is in some ways compelling. However, one feels obliged to ask, as Joanne Bargman did in the editorial, “Is there more to living than not dying?” (30). Indeed, components of the residual syndrome (e.g., poor appetite, sleep disturbances, restless legs, pruritus, cognitive impairment, etc.) may substantially diminish the quality independent of the length of life. As shown by Blake and O’Meara (1), subtle neurophysiologic deficits afflict even young highly functioning dialysis patients. A dialytic intervention that could lengthen life by reducing cardiovascular events should therefore not be our only goal in a population of individuals who are largely aged >60 years, and three-quarters of whom have had decades of diabetes and hypertension. Even if achievable, a few months of extra life may mean little to a person encumbered by multiple disabilities, especially if improved life expectancy were obtained at the cost of more hours of hemodialysis treatment. Better quantification of any of the onerous facets of the residual syndrome (Table 1) should provide us with better endpoints for exploring the contribution of retained solutes to uremic illness. Several candidate solutes have been tested for their relation to outcomes in dialysis patients. These tests have focused almost entirely on mortality and cardiovascular disease because outcomes and the relations of solute levels to more subtle morbidities have not been much assessed. Higher levels of p-cresol sulfate have been associated with increased mortality (16,28,31,32). Indoxyl sulfate levels were reported to be associated with mortality and cardiovascular disease across a range of GFRs (33). In addition, greater concentrations of asymmetric dimethyl arginine and symmetrical dimethyl arginine, whose plasma level rises in CKD, predict death in ESRD patients (34,35). In a small study, no relation could be found between four retention solutes (monomethylamine, ethylamine, indoxyl sulfate, and p-cresol sulfate) and either olfactory discrimination or global assessment of nutrition (36). All of these studies have used assays targeted for specified solutes. By contrast, untargeted analysis by mass spectroscopy has begun to achieve success in other areas of risk prediction. For example, Wang et al. identified three metabolites of the dietary lipid phosphatidylcholine (choline, trimethylamine N-oxide, and betaine) and linked them to risk of subsequent cardiovascular events in a cohort of participants undergoing elective cardiac evaluations (37). Coupling such methods of untargeted solute analysis with quantifiable components of the residual syndrome would seem a promising approach for the future. By analogy to Koch’s postulates for proving the causal role of a microbe in infectious disease, infusion of a test solute into an experimental animal with reproduction of some component of the residual syndrome would be a satisfying step in assessing candidate toxins. There are only limited examples of this approach. For example, feeding indoxyl sulfate to hypertensive rats was shown to exacerbate vascular calcification (14). There are several explanations for the paucity of such studies. First, most of the disabilities in Table 1 have not been well quantitated in patients, much less modeled in animals. Furthermore, firm or even suggestive associations between particular solutes and most of the morbidities experienced by patients with ESRD are few. Therefore, the choice of solute for infusion would itself be almost capricious. A related deficiency in this area is the lack of an animal model of ESRD treated by dialysis. Because of the high metabolic rates of small mammals, such a model would need to be created in larger animals such as pigs or dogs. This approach would potentially be very useful but also costly. Application of candidate uremic toxins to cell culture in vitro is another tactic and there are more examples of such work than that of in vivo studies of uremic toxicology. Both indoxyl sulfate and p-cresol sulfate can provoke abnormalities in cultured endothelial cells and the vasculature of experimental animals that are reminiscent of in vivo human pathology (14,38). The study by Meijers et al. 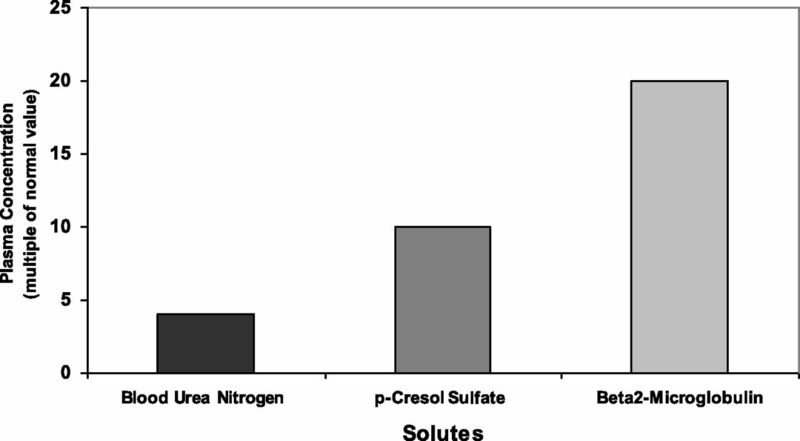 with p-cresol sulfate is particularly attractive because the in vitro effect, release of microparticles, mirrored the in vivo association of p-cresol sulfate levels and levels of microparticles (38). More sophisticated approaches such as using gene expression patterns in response to uremic fluid, fractions thereof, or specific candidate toxins have not been reported. The strongest test of a solute’s role in producing a sign or symptom would be to selectively lower its levels in human participants with ESRD and show a diminution in that sign or symptom. This approach has not been applied to any specific solute. The aggregate contribution of large solutes to uremic illness, however, has been tested first by the use of high-flux membranes and later high ultrafiltration rates to selectively increase their clearance. Results thus far have unfortunately not been strongly positive. Recent studies have identified means to utilize a similar approach for protein-bound solutes. Increases in dialyzer surface area and dialysate flow rates can double the clearance of bound solutes (39). With constant production, this should reduce their plasma levels by almost half. The increase in bound solute clearances can be obtained without altering urea clearance so that urea levels can be held constant while reducing the levels of bound solutes. A key element in exploring the role of selected solutes using such a design will, as we have emphasized, be the careful choice of endpoints. An alternative to improving solute removal is to reduce solute production. A problem is that the metabolic sources for many potential uremic toxins are unknown. However, the microbial population of the colon has emerged as a source for a large number of retained solutes (40,41). When ESRD patients who had undergone colectomy were compared with other ESRD patients with intact gastrointestinal tracts, p-cresol sulfate and indoxyl sulfate were nearly absent in patients lacking a colon (41). More than 30 other compounds, most of which were not yet chemically identified, also emanated from the gut. Of course, it is still uncertain which, if any, are toxic. However, colonic production of retained solutes stands as an example of a potentially modifiable production site (42). Niwa pioneered the use of an oral sorbent to reduce levels of indoxyl sulfate and other gut-derived uremic solutes (43). The production of such solutes may also be reduced by alteration of the diet (40,44). Hemodialysis has not only become widely available but has undoubtedly improved over the last 40 years. However, morbidities still persist and attempts to understand their chemical etiologies have lagged behind other major advances in the field such as more accurate ultrafiltration, bone and mineral therapy, and mitigation of anemia. Over the last decade, a few solutes have begun to receive serious attention as potential toxins but progress has been slow. The reasons for this slow pace certainly include the chemical complexity of the uremic milieu and the multiplicity of clinical disturbances within the standardly dialyzed population. However, improving techniques for chemical analysis and the prospect of clinically meaningful quantifiable endpoints should propel more investigation. That one solute or even one class will account for all aspects of the residual syndrome seems unlikely. Undoubtedly other components of chronic hemodialysis therapy beyond retained solutes, such as episodic volume removal, also contribute morbidities. Effective therapy of most chronic conditions requires targeting multiple mechanisms. Adequate treatment of diabetes encompasses not only glycemic control but also BP and lipid therapies. Unraveling the complexity of the residual syndrome is daunting but that does not mean that it is insoluble. However, it is certainly insoluble if never attempted. Efforts to resolve the residual syndrome by utilizing yet more intensive dialysis based on urea removal may have some benefits. However, such efforts will likely have only a modest effect on some important solutes while significantly increasing the burden on patients and providers. We need to know which solutes or at least which classes of solutes are generating which disabilities and where these solutes come from if chronic dialysis care is to advance rationally. We must do better than simply doing more and more of what was done 40 years ago. This work was supported in part by grants from the National Institutes of Health to M.D. (5T32DK007470), T.W.M. (5R01DK080123), and T.H.H. (5R01DK080123).